I just found and read this introduction to your blog. The love expressed brought tears to my eyes…..not that that is hard to do……they say I have inappropriate crying. ?.lol I feel my tears ARE appropriate! My TBI was 10 years ago, I believe, I was a newly we 50 year old then, financially successful and quite happy. Learning to deal with the new me was difficult at best for me and unbearable for my wife……it took 5 years before I even began to understand TBI and years to learn coping skills needed to manage all thatgoeswith TBI…….these years were also very difficult on my family and friends……sometimes I think jt is harder for loved ones than the survivor. Once I began to understand my new life, how to manage my life, I began to improve to where I could get through the days with some quality and even enjoyment I began to thrive as the new me. My wife who had simply turned to prayer began to feel kindness and understand towards me and things really beganto improve for us……..I feel loved again, she like yourself has fallen in love with a new man. I thank you for sharing your story and look forward to reading more. it is a great story of recovery and I hope it can be educational and encouraging to others who have had their lives touched by TBI. First, thanks for reading my blog and posting your comment. Your story made my eyes well up too. And yes, they were appropriate tears. TBI offers so many challenges and for many they may be too hard to handle. I can understand that. 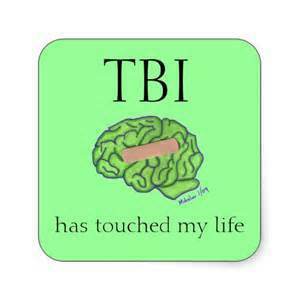 I am just grateful that my husband and I can work around his TBI. I am so happy that it seems you and your wife have come to terms with yours. Do I miss the man my husband used to be? Yes – a resounding YES! But, if he were to somehow magically reappear, I know I would miss this new version of him. So I’m going to just settle in and make the most out of our new life together. Stay tuned. I will be adding to this blog as soon as I can. I will definitely check out your blog. Beautiful. I love how you live those marriage vows….and look ahead to the “better once again.” As the mom of someone whose brain changed due to schizophrenia, I feel your commitment and love – and your pain that becomes determination. I join all who are rooting for you ! Thank you so much for your thoughts. I am honored that you read my blog and that you took the time to reply. I read your book, “Ben Behind His Voices,” about two weeks ago and felt your pain and confusion and your frustration as you worked your way through “the system.” I admire your strength and your commitment to your son as you forced each door open while others were slammed shut. You are a very strong woman, and “Ben” is lucky to have you as his mother. I know that your story is not over and that there will still be many hard times ahead, and I wish you all the best. I hope that someday soon you will be able to read my story about my husband, “Prisoner without Bars: Conquering Traumatic Brain Injury.” It is searching for a publishing home now. I think that you should know that I was recently sent a link for an article in huff post where the person uses your exactly phrases and provides no credit to you. They also do other things that are ripping you off like starting a faces of TBI thing and more. You are so right. Each brain injury and caregiving experience is like a fingerprint or a snowflake. None exactly alike! It sounds like you have a lot on your plate and a good head on your shoulders – TBIs and all. I think you should be aware that someone is stealing your words, your ideas and pretty much everything you are doing and have been doing only they are always a few months behind you. Yes- they phrase some of it just a little bit differently- but some like the Faces of TBI thing is a direct rip off. If you have a lawyer or could get one, I think you should know that they are being paid to steal your stuff and claim it as their own. Email me if you want more information please. Thank you for the heads-up. I did find my statement in an article on HP. I was not able to find “Faces of Brain Injury.” I truly hope that this was a “flattering” coincidence. I spend countless “unpaid” hours every day to write this blog for the benefit of all my readers. If you can send me information on “Faces of Brain Injury” that would be helpful, though I think that many may have used that title before and after me since it seems generic. I really appreciate your concern and your reading and commenting on my blog. I will be aware. i wake up everyday and try not to think of killing myself after 9 years this fatigue is not going away and im tired of being hungry and poor and treated as if i am lazy and living wrong and not heard and family members who sabbotage my ssi case have accused me of fraud well nobody helps i stopped reaching out in march and unjoined the support groups because telling me to take notes to help remember does not do it. so what ever . Carnipicus, sigh … I’m trying to figure out what to write to you that won’t seem trite. So many brain injury survivors feel as you do, and so many of their family and friends simply do not understand. Brain injury does unthinkable damage. I hope that you will not quit the support groups. Connecting with people and sharing thoughts can be beneficial. You just have to pick and choose. Here is an article I wrote. Maybe you can find some nugget of help in it. Donna, I have been scouring the internet for any and all advice on how to live as a spouse of someone with TBI. My journey as this spouse has just begun. It began October 15, 2017. It hasn’t been a long journey, but it’s seemed I have been in this role for so long, my old life seems so far behind me. I am touched to read your story as that spouse for your husband. I feel as if I have become sleepless. I can relate to you being in between teaching first and third graders, I am a third grade teacher now. Was first grade before this year. My husband had a hemorrhagic stroke. Was given 3% chance survival. He is awake and talking, very confused, but responsive. He took 16 steps holding onto parallel bars yesterday with the help of the PTs in the gym at his hospital. I felt so much for him as he looked into the mirror that stood before him as he took those 16 steps… I can’t imagine. I am so blessed to have health. I love your attitude, and the word “cheerleader” you used to describe your new role as a TBI survivor’s wife. Many blessings to you on this journey! I am so sorry that you are able to join our exclusive “club” of spouses of brain injury survivors. It’s a hard journey. It seems we have so much in common with our husbands and our careers. David and I are closing in on 13 years post trauma. It’s not been easy, but I am so happy to still have my husband. I would be more than happy to help you in any way that I can. My personal email is neelyf@aol.com. There is a lot of good information on my blog too, just poke around.